1.Does anyone know what is causing the Pagebuttons to act like this? Whenever I increase the "item_backpack_offcenter_x" value, the width of the pagebuttons is decreasing. Is there any way to get around this and change the width and xpos of the buttons on their own? 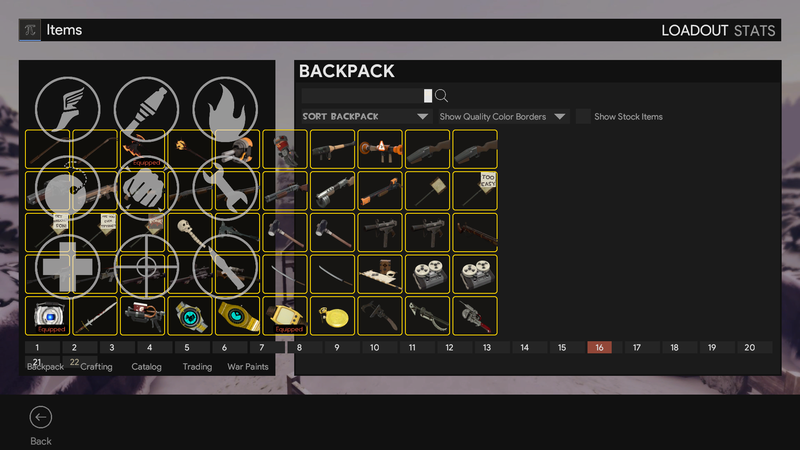 If not, is there any way to change the xpos of the Backpack items without "item_backpack_offcenter_x" atleast? 2. The font of "SortByComboBox" is also not changing, no matter what I try. Any idea what could be causing this? 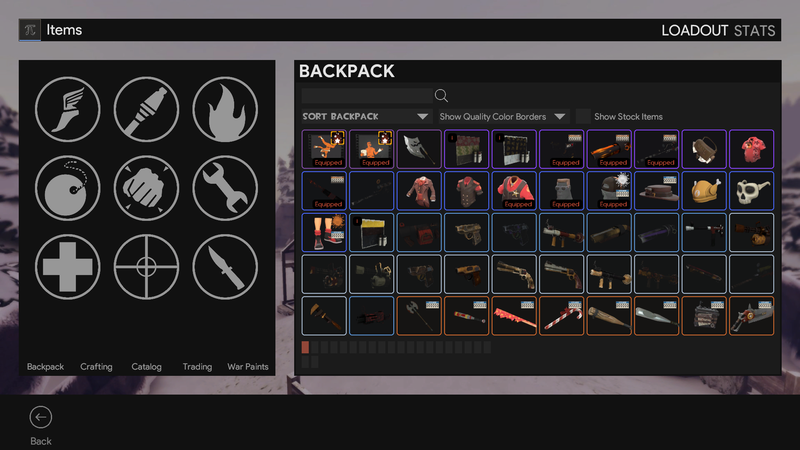 And as a suggestion: I'd move the search box to the top right field above in the bar of the 'Backpack' title. I tried modifying these two wide values, but that didn't change anything. Changing the "page_button_per_row" also changes the width of the buttons. 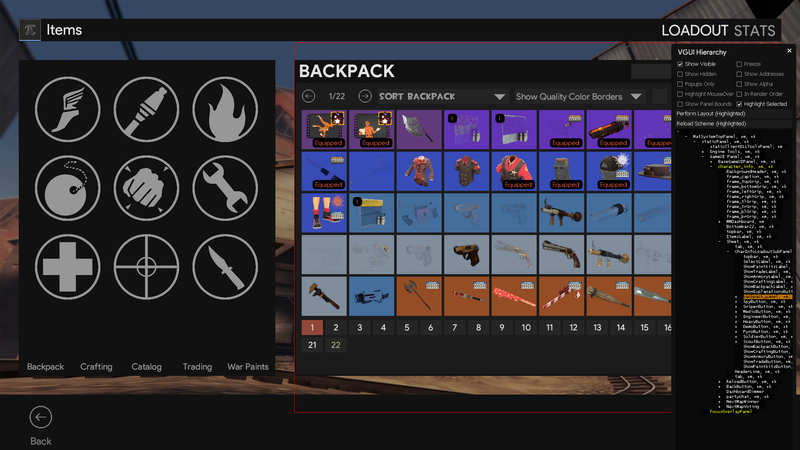 For some reason the buttons won't go any further than about the fourth item column, when I use "item_backpack_offcenter_x" "-105". No idea what's causing this. Here's the whole thing. Maybe you can find my mistake. Try changing the "TextAlignment" tag for the numbers. @JB, I assume you want your 'backpackpanel' to simply be moved to the right. Instead of messing with weird offsets, actually just 'shrink' the backpack_panel and move that, then the offcenter and xpos values don't get weird values trying to correct odd forced behaviour. Especially if you start using pin_to_sibling you only need to move your background and change the item offcenter (if that) to move everything to the left or right! Reduced the overall width of the panel, corrected the alignment of items and page buttons. Especially if you start using [i]pin_to_sibling[/i] you only need to move your background and change the item offcenter (if that) to move everything to the left or right! not really a hud editing question but i didn't want to start a new thread for it either. Has anyone updated PV Hud recently? Sinetinot really a hud editing question but i didn't want to start a new thread for it either. Did you not bother looking through the github repository? [quote=Sineti]not really a hud editing question but i didn't want to start a new thread for it either. _Kermit Sinetinot really a hud editing question but i didn't want to start a new thread for it either. i found the old pv hud on github, it said last updated 3 years ago. [quote=_Kermit][quote=Sineti]not really a hud editing question but i didn't want to start a new thread for it either. Wiethoofd@JB, I assume you want your 'backpackpanel' to simply be moved to the right. [quote=Wiethoofd]@JB, I assume you want your 'backpackpanel' to simply be moved to the right. You can use the vgui_drawtree refresh on the 'charinfoloadoutsubpanel' instead of the backpack_panel, that should also work, but the 'reloadscheme button' is a lot easier. What is the path you're using to the texture files? If you use the same paths as the original valve ones they will only work when you're not on a sv_pure 2 server, if you want them to always work you have to put them in [i]materials/vgui/replay/thumbnails[/i] together with a vmt. [quote=Wiethoofd]What is the path you're using to the texture files? solly6materials/vgui/replay/thumbnails is the path where I placed the texture files. Still doesn't work. Did you also add VMTs for each VTF, fixing the path inside the VMT to the new path in the thumbnails folder? solly6 Wiethoofd solly6materials/vgui/replay/thumbnails is the path where I placed the texture files. Still doesn't work. Did you also add VMTs for each VTF, fixing the path inside the VMT to the new path in the thumbnails folder? How do i go about removing the friends list from Collyhud without ruining the whole main menu? I know it's in mainmenuoverride called "friendscontainer" as I've done this before with other huds. However, with collyhud, every way i do it. i just end up having no main menu. I fixed the issues the hud had, I moved the targetIDs and the ubermeter a while ago, forgot to publicly post the updated link. solly6Is there a way to make the class portraits static? 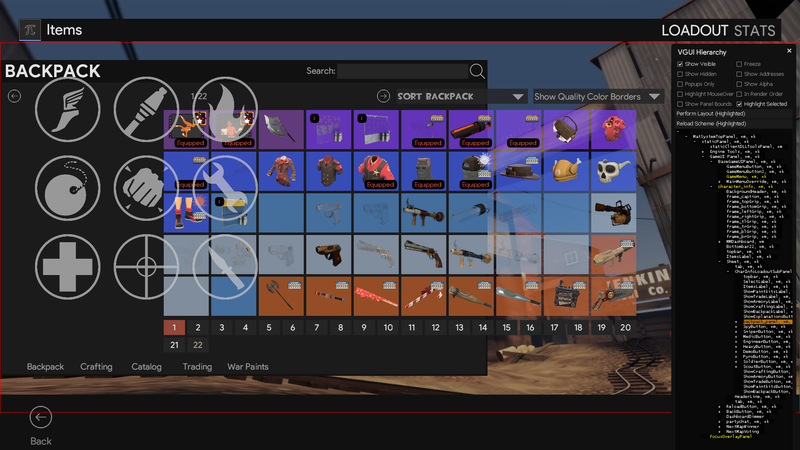 Every time I hover my mouse to the armory section the class portraits move or something. Quick question: when I am hurt my PlayerStatusHealthBonusImage (the red cross) only flashes once and then stops looping. Its a really common thing I know, but I'd be happy to hear if someone is willing to help. [quote=creeproot]Quick question: when I am hurt my PlayerStatusHealthBonusImage (the red cross) only flashes once and then stops looping. Its a really common thing I know, but I'd be happy to hear if someone is willing to help.